The popularity of full-size pickup trucks in the US is enormous but many brands have recognized that demand for more compact models is growing. After some mid-size versions returned and they have gained great popularity, more brands considering their small-truck offerings. The main reasons why buyers want downsized truck versions than full-size models are better fuel economy and more maneuverable size for urban ride. Ford is also considering returning small-truck in the US ever since it discontinued Ford Ranger in this market. However, according to some sources, Ford doesn’t think to return Ranger in US because this model is very close in size as the top-selling F-150, yet it want to design more compact version. So, rumor has that Ford has in mind new Ford Ranchero Concept model which would actually be close in size as this name model that was produced in 60s and 70s. This model was adapted on the station wagon platform and included two-door cab and cargo bed. However, new concept model from the Ford Company is rumored to take new modern approach when it comes to the design, platform and others. Design has proven as major selling point and according to some reports, Ford will design the new Ford Ranchero Concept to stand out from the crowd. This model is rumored to borrow some cues from the attractive Atlas Concept but it will also blend dynamic design from brand’s passenger cars and bold elements from Ford’s trucks. Dynamic sheet-metal sculpting on the new model should bring a new level of attraction in the pickup segment. It will have fluid design on the hood and side panels and the front fascia will get special treatment. 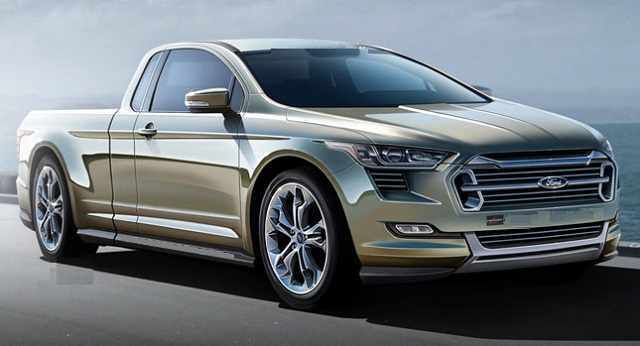 It will include large trapezoidal shaped grille, slim headlights and sleek almost car-like front bumper. Model will also has improved aerodynamics thanks to the smaller size ad more streamlined design. Interior of this vehicle should be very functional and comfortable, comparable with passenger-oriented vehicles. Ford would use high-quality materials for upholstery and it will also be equipped with the latest technology. Modern infotainment system will provide intuitive functionality and many connectivity and other features. It will also add comfortable seats with heating, cooling and power adjustable functionality. This model should also get many safety features that are available on the passenger’s cars. When it comes to performance, it is important to say that Ford Ranchero Concept has been rumored to be designed on unibody platform. The body-on-frame construction is traditional on almost all pickup trucks sold in the US (only Honda Ridgeline uses unibody design) but with new compact unibody built new Ranchero model will be able to deliver much better ride quality comparable with modern SUVs. It will also have the structure built from lightweight materials which should reduce its weight and improve fuel economy. This model should also use EcoBoost four-cylinder engines which should provide adequate power and great fuel economy. Model will get automatic transmission and standard front-wheel drive with optional four-wheel drive for off-road and bed conditions. There isn’t official announcement from the Ford regarding this model. According to some sources, the new Ford Ranchero Concept could be presented sometime in 2017. How much do you think it would start at?